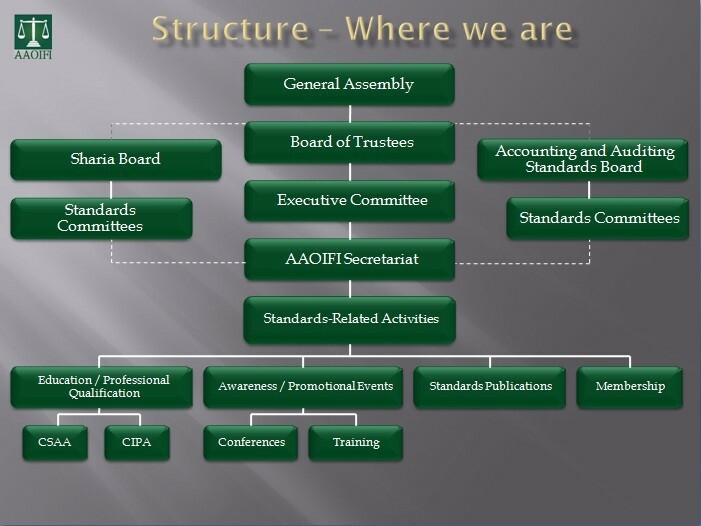 AAOIFI standards have been developed in consultation with leading Sharia scholars, with several counties adopting them. Although AAOIFI standards are not binding on members, over the last few years the organisation has made significant progress in encouraging the widespread adoption of the standards. Fiduciary risk: the Mudaraba contract places liability of the loss on the mudarib. Displaced commercial risk: where Islamic banks “smooth” the returns Investment Account Holders (IAH) by varying the percentage of profit taken as Mudarib share. As a result, with the support of banking authorities, AAOIFI standards were created. In an industry that is often quite fragmented, it is hoped that the development of AAOIFI standards will go a long way in promoting convergence in Sharia standards and leading to further growth in this nascent market. 1. Objective of financial accounting for Islamic banks and financial institution (IFIs). 2. Concept of financial accounting for IFIs. 3. General presentation and disclosure in the financial statements of IFIs. 4. Murabaha and Murabaha to the purchase orderer. 7. Disclosure of bases for profit allocation between owners’ equity and investment account holders. 8. Equity of investment account holders and their equivalent. 9. Salam and Parallel Salam. 10. Ijarah and Ijarah Muntahia Bittamleek. 12. Istisna’a and Parallel Istisna’a. 14. General Presentation and Disclosure in the Financial Statements of Islamic Insurance Companies. 15. Disclosure of Bases for Determining and Allocating Surplus or Deficit in Islamic Insurance Companies. 17. Provisions and Reserves in Islamic Insurance Companies. 18. Foreign Currency Transactions and Foreign Operation. 20. Islamic Financial Services Offered by Conventional Financial Institutions. 21. Contributions in Islamic Insurance Companies. 22. Deferred Payment Sale . 23. Disclosure on Transfer of Assets. 1. Objective and principles of auditing. 3. Terms of Audit Engagement. 4. Testing for Compliance with Shariaa Rules and Principles by an External Auditor. 5. The Auditor’s Responsibility to Consider Fraud and Error in an Audit of Financial Statements. 1. Sharia Supervisory Board: Appointment, Composition and Report. 4. Audit and Governance Committee for IFIs. 5. Independence of Sharia Supervisory Board. 6. Statement on Governance Principles for IFIs. 1. Code of ethics for accountants and auditors of IFIs. 2. Code of ethics for employees of IFIs. 3. Default in Payment by a Debtor. 4. Settlement of Debt by Set-Off. 6. Conversion of a Conventional Bank to an Islamic Bank. 8. Murabaha to the Purchase Orderer. 9. Ijarah and Ijarah Muntahia Bittamleek. 10. Salam and Parallel Salam. 11. Istisna’a and Parallel Istisna’a. 12. Sharika (Musharaka) and Modern Corporations. 20. Commodities in Organised Markets. 21. Financial Papers (Shares and Bonds). 29. Ethics and stipulations for Fatwa. 36. Impact of Contingent Incidents on Commitments. 39. Mortgage and its Contemporary Applications. 40. Distribution of Profit in Mudarabah-based Investments Accounts.